1. Cut tofu into slices slightly thicker than half a centimetre. Mop up any excess moisture with paper towels and sprinkle lightly with salt and crushed pepper. 2. Heat 1 tsp oil in a non-stick frying pan over medium heat and fry half the tofu slices until lightly seared on both sides. Remove onto a plate, heat the remaining teaspoon of oil and fry the remaining tofu slices. Set aside to cool. 3. Cut each cucumber into half (crosswise) and then into thin slices lengthwise – to make ‘ribbons’. Cut onion into half lengthwise and then into thin slices. 4. 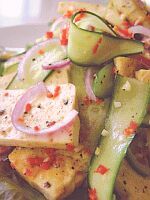 Place the cooled tofu, cucumber and onion in a mixing bowl. Combine the dressing ingredients together in a small bowl and pour over the salad ingredients in the mixing bowl. Toss gently before serving on a lettuce-lined serving plate or bowl. Eat soon after assembly.